We’ve got some very exciting news to share! Our team was recently selected as a top national finalist for the Business of the Year award from the U.S. Chamber of Commerce! This means we’ll be headed to Washington D.C. soon, get to meet a lot of exciting people including Marcus Lemonis (from the TV show The Profit), and have a chance to win a grand prize of $25,000 cash from Metlife. businesses and honors their contributions to America’s economic growth. BrandHoot – Rochester, MN <– is that really us?! 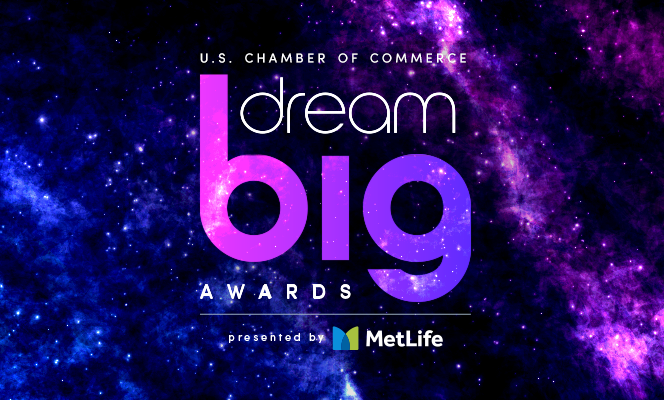 Award winners will be announced at the Dream Big Awards Celebration on Tuesday, September 12 in Washington, D.C. as part of the 2017 Small Business Summit taking place at the Omni Shoreham Hotel. Finalists are entered in to an online ballot for our Community Excellence Award. The Community Excellence Award recognizes a small business that has demonstrated an exemplary level of leadership and community engagement to positively impact the quality of life in its community. Online voting, running now through July 31, will allow the people who know a company best—its customers, employees, and neighbors—to cast a vote for their favorite business. As founder & CEO, Nate has a passion for family, team building, quality, learning, and innovation. He enjoys helping inspire our next generation of leaders, and is the youngest ever Board Member at the Rochester Area Chamber of Commerce.